It’s October 1990. Jacob Putnam is young and full of ideas. He’s arrived a year too late to witness Czechoslovakia’s revolution, but he still hopes to find its spirit, somehow. He discovers a country at a crossroads between communism and capitalism, and a picturesque city overflowing with a vibrant, searching sense of possibility. As the men and women Jacob meets begin to fall in love with one another, no one turns out to be quite the same as the idea Jacob has of them—including Jacob himself. 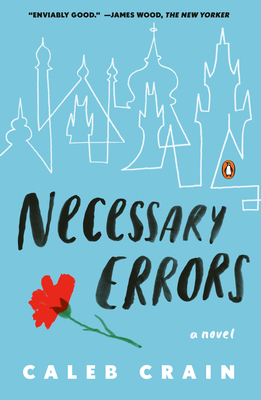 Necessary Errors is the long-awaited first novel from literary critic and journalist Caleb Crain. Shimmering and expansive, Crain’s prose richly captures the turbulent feelings and discoveries of youth as it stretches toward adulthood—the chance encounters that grow into lasting, unforgettable experiences and the surprises of our first ventures into a foreign world—and the treasure of living in Prague during an era of historic change. Caleb Crain is a frequent contributor to the New Yorker, the New York Review of Books, the Nation, the New York Times Magazine, the London Review of Books, n+1, the Paris Review Daily, and the New York Times Book Review. A graduate of Harvard and Columbia, he is the author of the critical work American Sympathy. He lives in Brooklyn, New York. “Evocative. . . . Necessary Errors so completely recaptures the smells and scenes and political conversations and above all the feelings of 1990-1991 Czechoslovakia that I began to actively worry that Mr. Crain was inserting new memories into my brain."